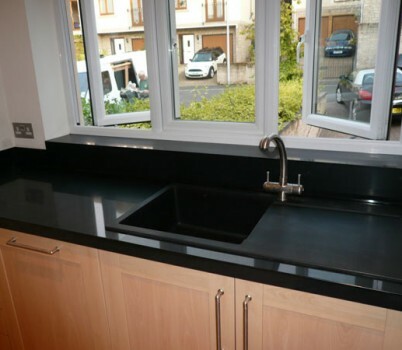 Established in 2004 we have been supplying overlay granite/quartz worktops in the South West area for over 10 years now. Due to our size all our customers benefit from a truly personal service , from concept and design through to supply & installation. However due to the vast number of colours and finishes available we feel it better not to have an expensive showroom , but instead bring the samples to you. This not only keeps our overheads down so we can give you better prices but by visiting clients in their own homes we are able to show you exactly how the product will look under your own lighting and help you choose the right colour to go with your existing décor, tiles and doors which is something you can’t appreciate when viewed in a showroom. Quartz-Lite worksurfaces are manufactured from silica Quartz, one of the hardest substances known to man, harder than granite, and combined with the latest state of the art polyester resins – the patented precision manufacturing process produces sheets only 8mm thick and a final product which is not only beautiful but extremely tough and diamond polished to produce a deep and lasting shine. Why Is Quartz So Beneficial? Quartz worksurfaces are hard and extremely durable kitchen worksurfaces and are an excellent choice of surface for the kitchen due to their resistance to damage by heat, liquid penetration and both staining and scratching. These overall qualities allow for an easy to clean surface, providing a hygienic and low maintenance kitchen environment. 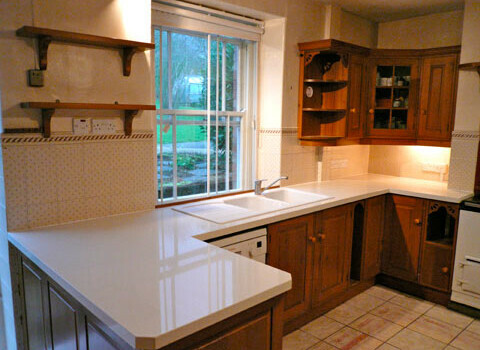 Quartz can also be applied to walls, splashbacks, upstands and plinths. Quartz-Lite can either be fitted over your existing kitchen worktops, be they wood, laminate or tiles and are made to measure for each unique kitchen or for new kitchens we offer our XT range of products where we can produce worktops with edge thicknesses from 12mm right up to 150mm to accommodate the latest design trends. For new kitchens our standard worktop though is 36mm where we use our 12mm material bonded onto a 24mm birch plywood frame, which not only provides a lighter alternative to solid quartz or granite worktops for your kitchen cabinets and with over 100 different colours to choose from we feel sure that there will be a colour to suit all tastes and palettes. Using our Perfect-Fit system, that we have developed over the last 10 years, we first of all carefully and accurately measure all your surfaces and discuss with you the most suitable place for any joints which are required. All joints are kept as small as possible and very often corners can be done in one piece. We then go away and fabricate your new surfaces ready for fitting. On the agreed date our fitters then install your new worktops, which are then carefully scribed back to your walls and tiles , assuring you of a perfect fit without any gaps.. This is then silicone sealed in a colour of your choice with the surfaces given a final clean and polish , ready for a lifetime of use.